Marketing is All Around Us - Ch.1 Marketing is All Around Us. 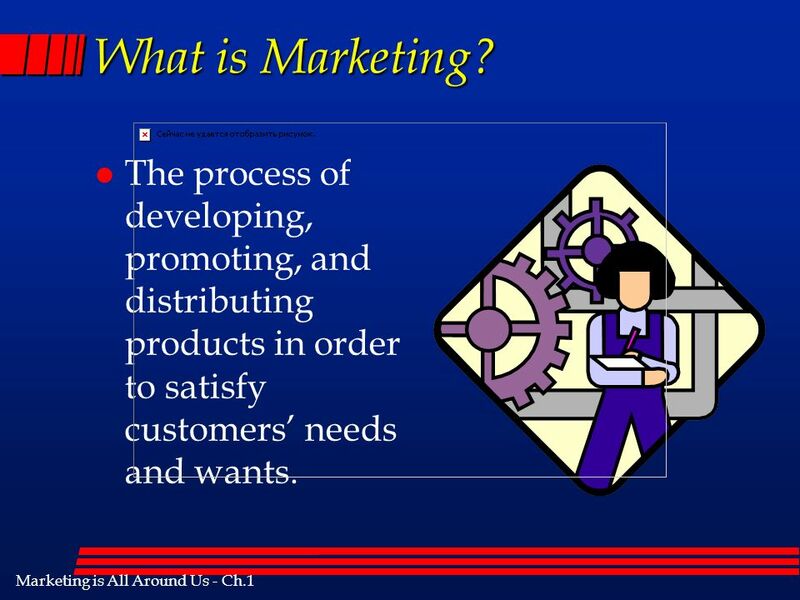 2 Marketing is All Around Us - Ch.1 What is Marketing? l The process of developing, promoting, and distributing products in order to satisfy customers needs and wants. 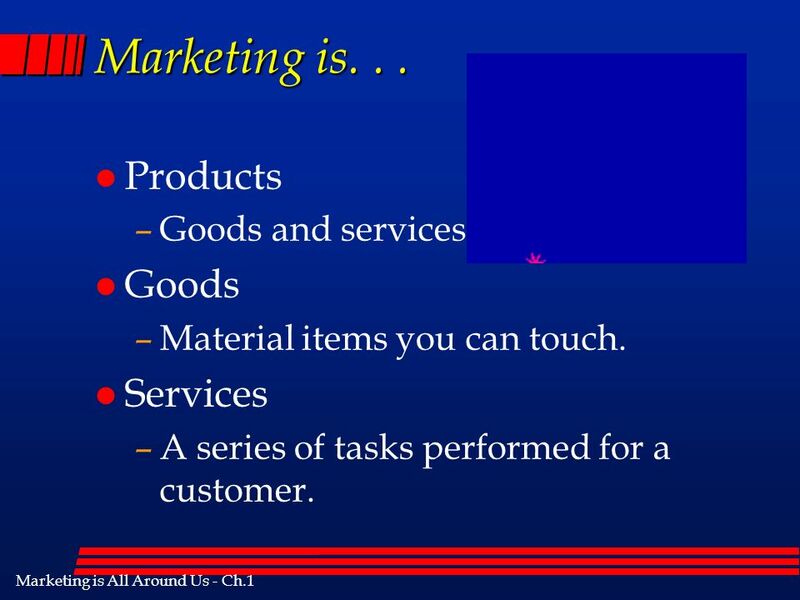 3 Marketing is All Around Us - Ch.1 Marketing is... l Products –Goods and services. l Goods –Material items you can touch. l Services –A series of tasks performed for a customer. 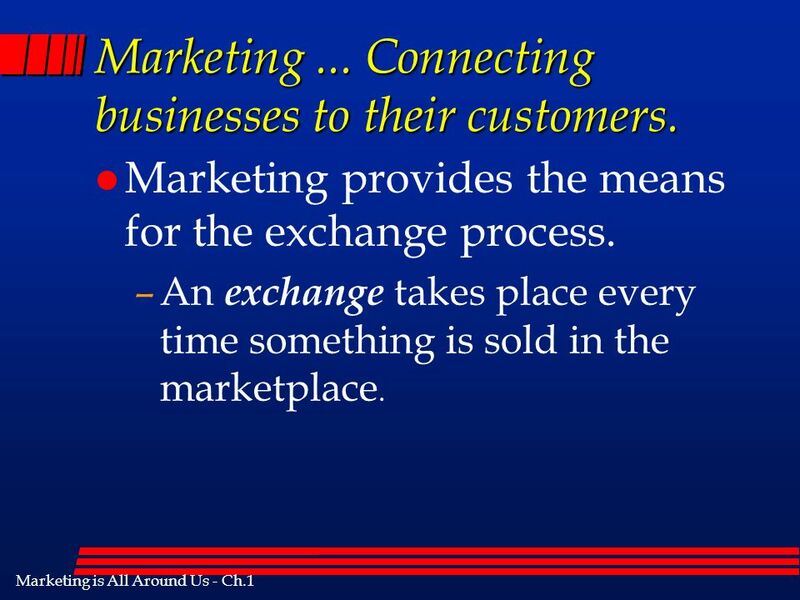 4 Marketing is All Around Us - Ch.1 Marketing... Connecting businesses to their customers. l Marketing provides the means for the exchange process. –An exchange takes place every time something is sold in the marketplace. 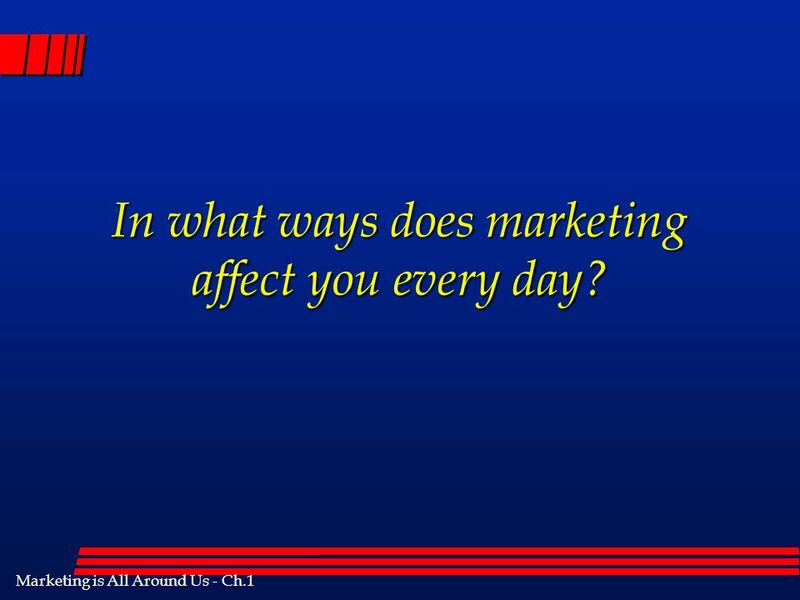 5 Marketing is All Around Us - Ch.1 In what ways does marketing affect you every day? 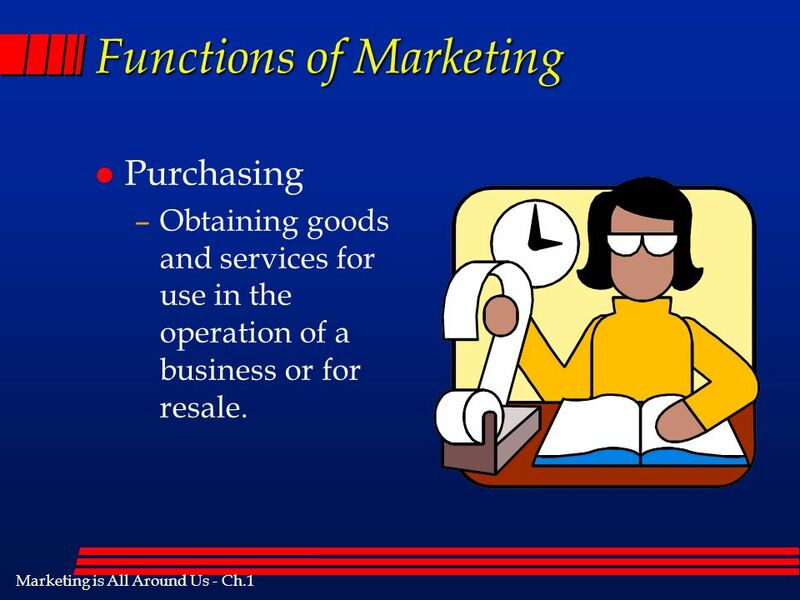 6 Marketing is All Around Us - Ch.1 Functions of Marketing l Purchasing –Obtaining goods and services for use in the operation of a business or for resale. 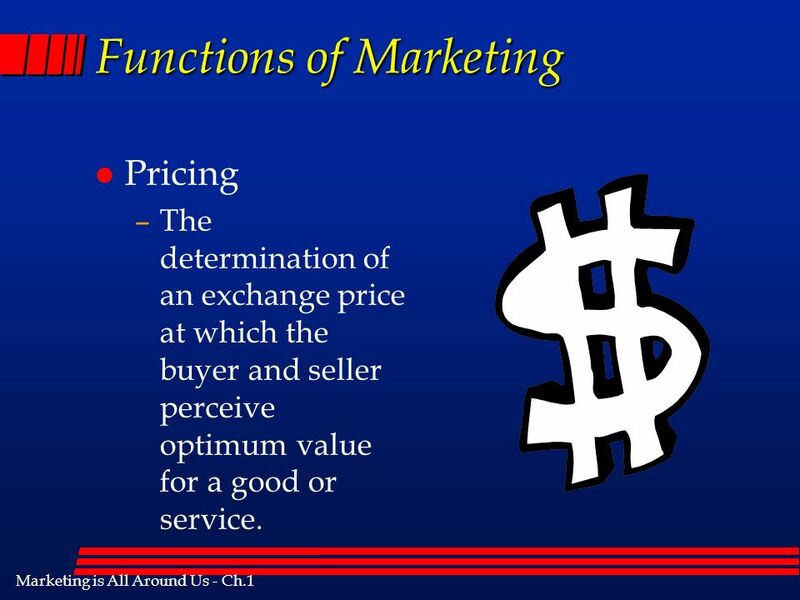 7 Marketing is All Around Us - Ch.1 Functions of Marketing l Pricing –The determination of an exchange price at which the buyer and seller perceive optimum value for a good or service. 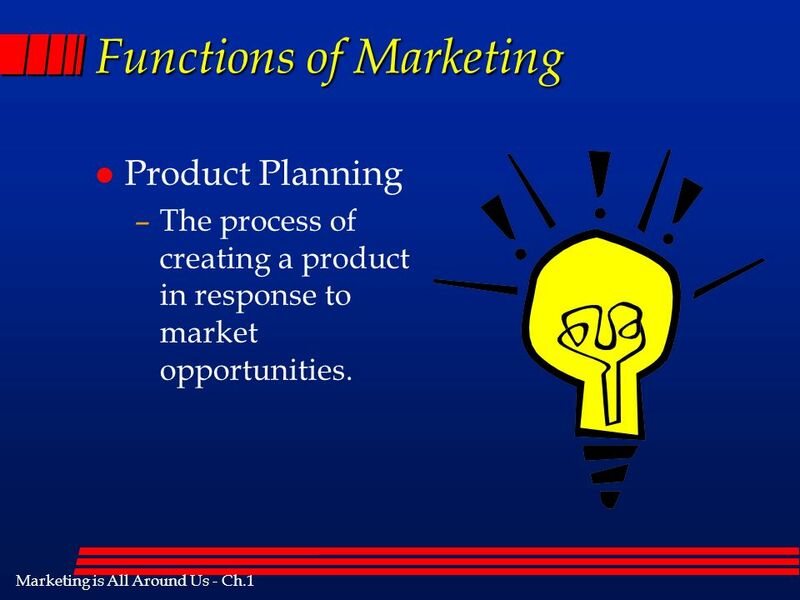 8 Marketing is All Around Us - Ch.1 Functions of Marketing l Product Planning –The process of creating a product in response to market opportunities. 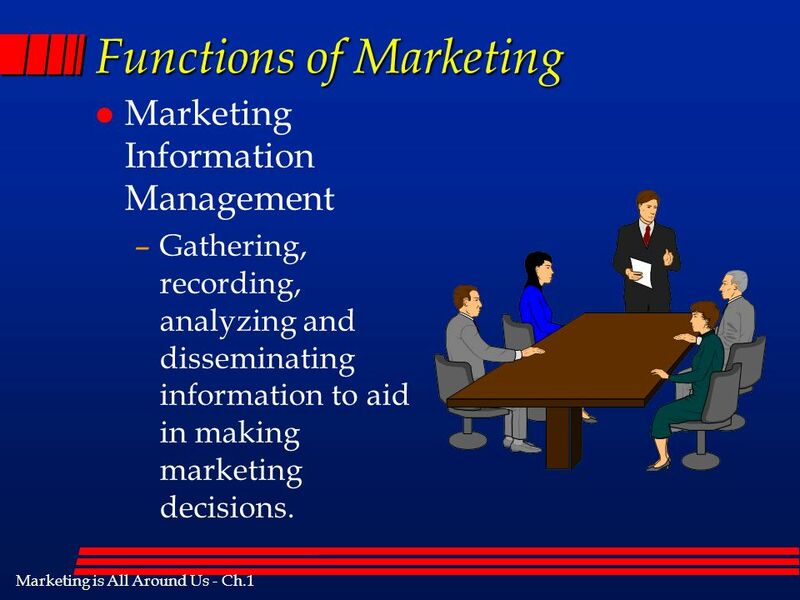 9 Marketing is All Around Us - Ch.1 Functions of Marketing l Marketing Information Management –Gathering, recording, analyzing and disseminating information to aid in making marketing decisions. 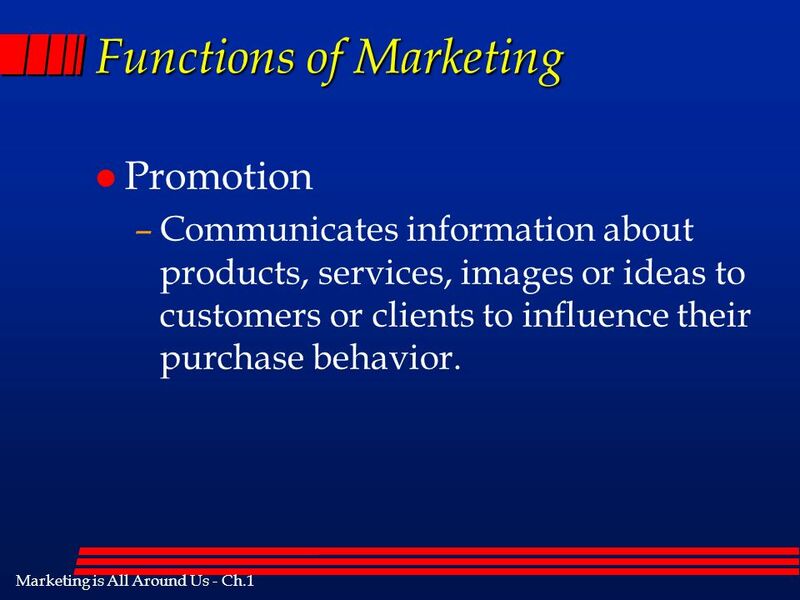 10 Marketing is All Around Us - Ch.1 Functions of Marketing l Promotion –Communicates information about products, services, images or ideas to customers or clients to influence their purchase behavior. 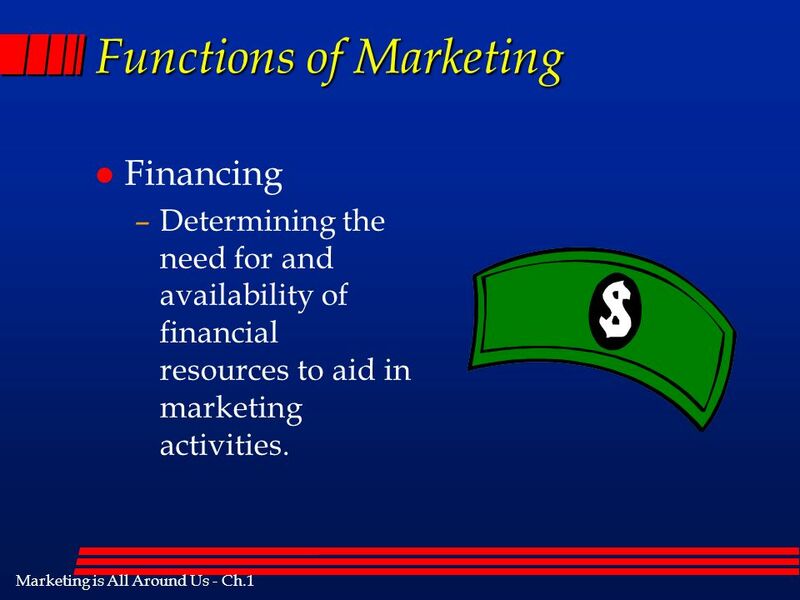 11 Marketing is All Around Us - Ch.1 Functions of Marketing l Financing –Determining the need for and availability of financial resources to aid in marketing activities. 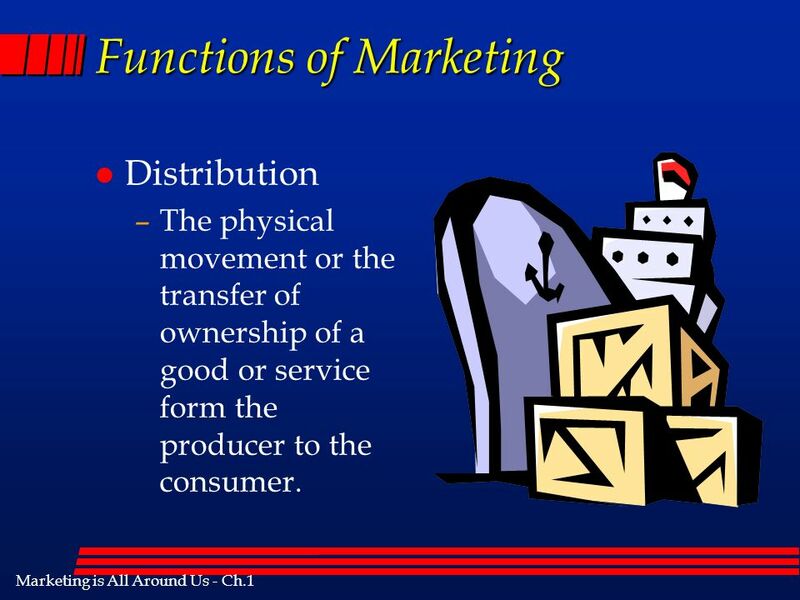 12 Marketing is All Around Us - Ch.1 Functions of Marketing l Distribution –The physical movement or the transfer of ownership of a good or service form the producer to the consumer. 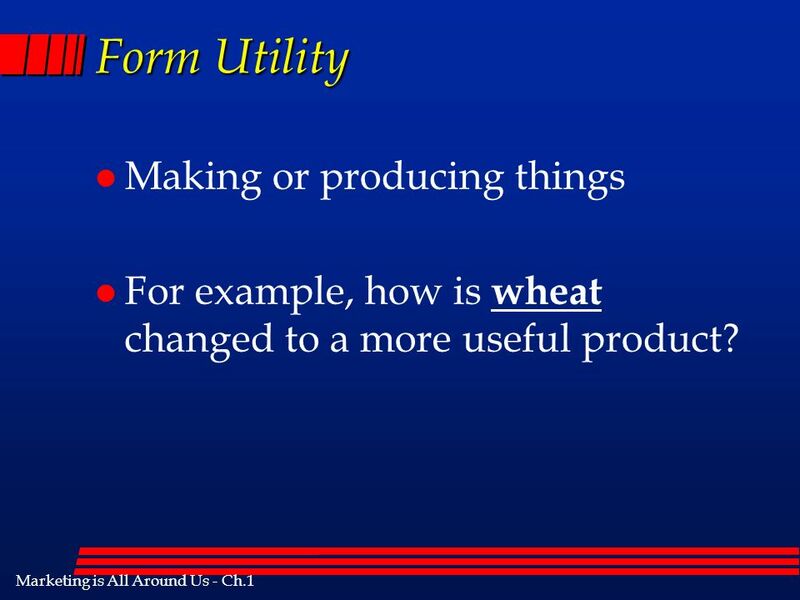 14 Marketing is All Around Us - Ch.1 Form Utility l Making or producing things l For example, how is wheat changed to a more useful product? 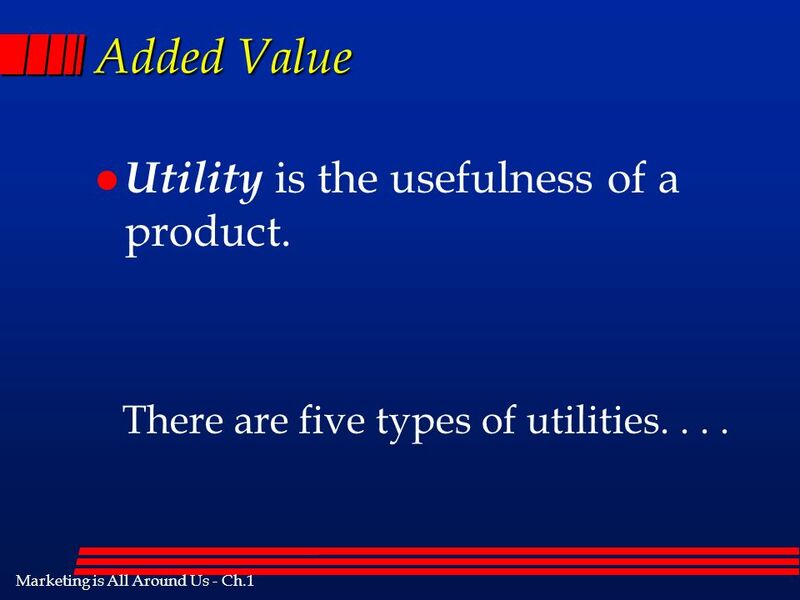 15 Marketing is All Around Us - Ch.1 Place Utility l The products usefulness is increased because of its location. 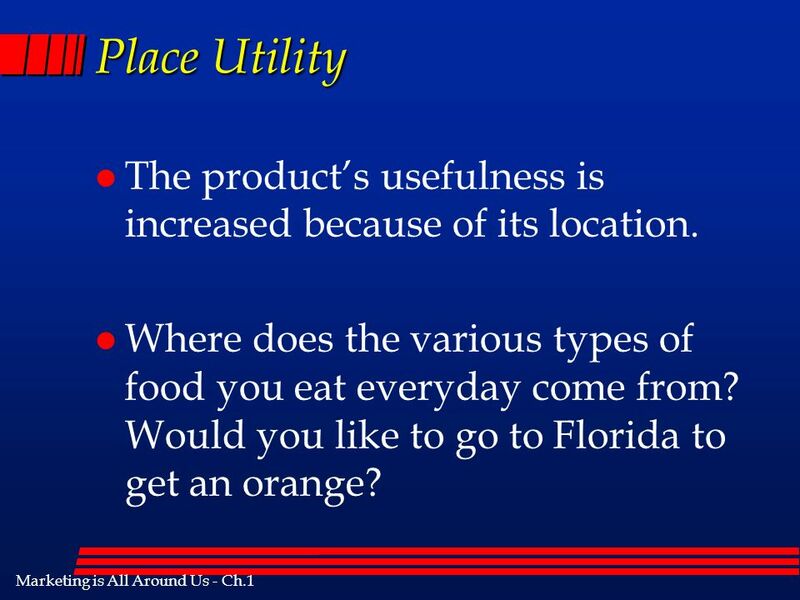 l Where does the various types of food you eat everyday come from? Would you like to go to Florida to get an orange? 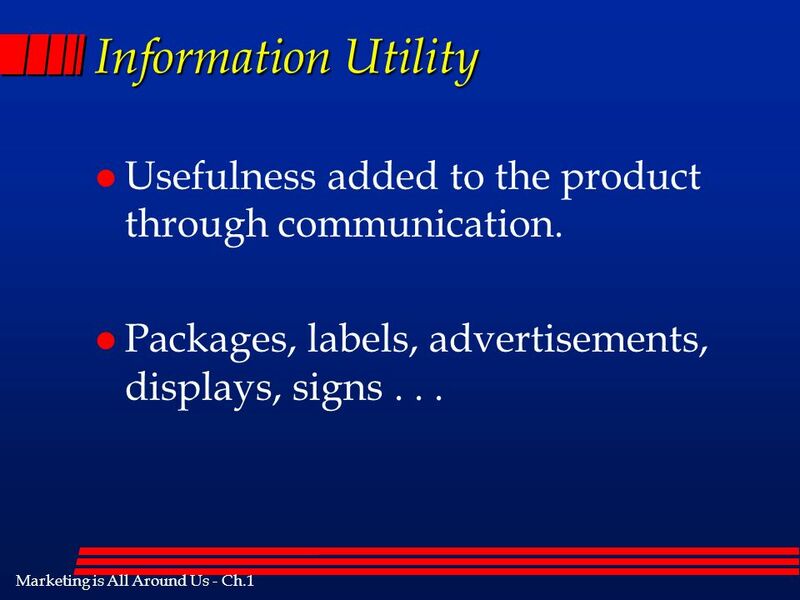 16 Marketing is All Around Us - Ch.1 Time Utility l Making a product available at the right time of year or a convenient time of day. l Ex. 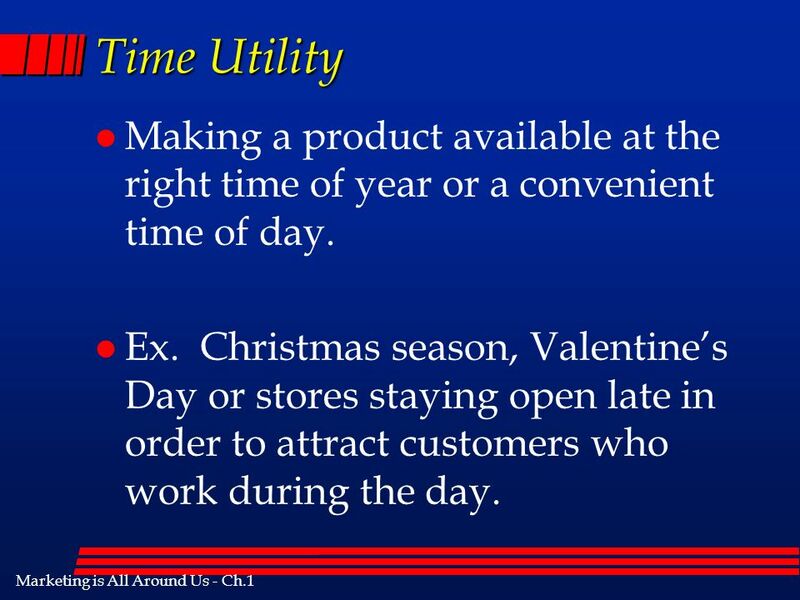 Christmas season, Valentines Day or stores staying open late in order to attract customers who work during the day. 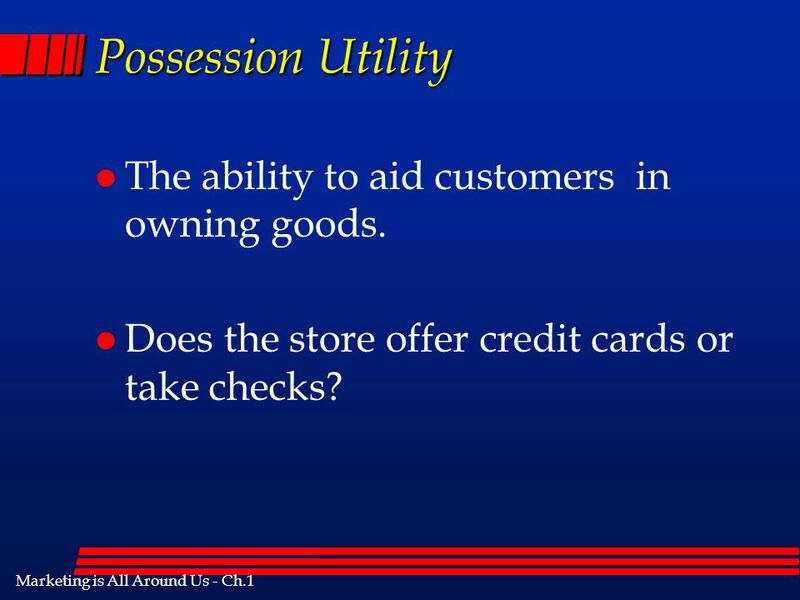 17 Marketing is All Around Us - Ch.1 Possession Utility l The ability to aid customers in owning goods. l Does the store offer credit cards or take checks? 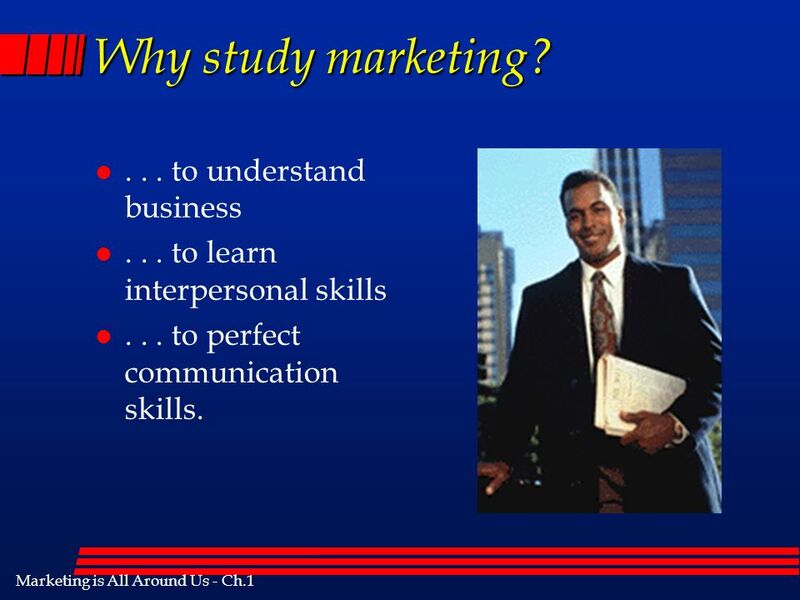 19 Marketing is All Around Us - Ch.1 Why study marketing? l... to understand business l... to learn interpersonal skills l... to perfect communication skills. 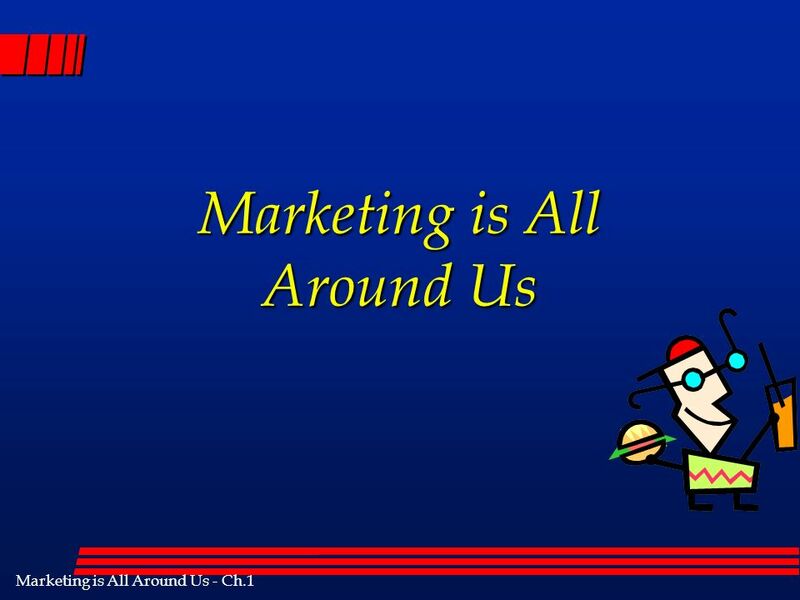 Download ppt "Marketing is All Around Us - Ch.1 Marketing is All Around Us." Chapter 12 Marketing and Customer Satisfaction Business Today. Marketing Is All Around Us What You’ll Learn . . . Fundamentals of Marketing LESSON 2: Marketing Concept. Marketing All Around Us! 2nd Period Marketing Principles.  Utility ◦ Utility defined ◦ Form Utility ◦ Information Utility ◦ Place Utility ◦ Time Utility ◦ Possession Utility. This morning on CNN Apple Inc spent years developing its iconic iPhone, but Samsung took a shortcut by copying its rival's designs after realizing it could.